FastestVPN is a new name in the VPN industry, but it is quickly gaining recognition thanks to the high security and amazing speed of its service. The VPN is designed to help customers to defend their privacy with strong encryption and at the same time, it offers fast performance and flexibility so that you can bypass restrictions and stream media content from anywhere in the world. Having been established in 2017, FastestVPN is just getting started, but it is already building a good reputation through its good set of features. With the variety of protocols supported by FastestVPN, you will enjoy security and flexibility to bypass restrictions on multiple platforms. You can select are L2TP, IKEv2, PPTP, OpenConnect, Xsec and OpenVPN, for which UDP and TCP are available. The best level of protection is achieved using OpenVPN, which is known as a stable and secure protocol. With strong 256-bit AES encryption, FastestVPN keeps your online data safe from threats like hacking and eavesdropping. Your entire internet traffic is secured to prevent intruders from accessing your personal information or seeing what you do online. NAT firewall, Malware protection and Ad blocker technology are also included, offering a comprehensive security solution for internet users. Privacy is also a strong area for FastestVPN as the provider doesn’t keep any logs of your online activities or your connection. They don’t monitor or keep record of information like the IP address you use or the websites that you visit. You can enjoy a high level of privacy when you use FastestVPN. Although they require your name and email address when you register, you can use an anonymous email address and select Bitcoin as payment method to protect your identity. Name and email address are the only details collected and FastestVPN promises not to share the data with third parties. Even if they are contacted by authorities requesting information, they won’t be able to provide any details about your activities or your use of the service. FastestVPN has dedicated VPN clients for Mac, Windows, Android and iOS. Their apps are user-friendly and allow you to connect to the server of your choice, without hassle. It is also possible to use FastestVPN on other platforms such as Linux, following the guides that tell you how to install the VPN manually. FastestVPN can also be set up on routers, which allows you to run the service on any device and platform you want. By default, FastestVPN can be used on 5 devices simultaneously. This gives you the chance to protect your mobile phone, laptop, tablet and more at the same time. We previously mentioned that NAT Firewall is included as part of the service. Some providers charge extra for this feature, but FastestVPN offers it without additional cost. NAT Firewall provides end-to-end protection against security threats. With FastestVPN, your connection is also protected from malware infections whenever you are connected to the service. You can also enjoy a better browsing experience, thanks to the ad-blocker that stops malicious ads that keep appearing when you are surging the web and that may be used to trace your activities. There is also a wide selection of IP addresses available that allow you to defeat restrictions and mask your identity and location to enjoy online anonymity. FastestVPN’s network comprises over 60 dedicated, physical, UNIX based servers that provide fast data transfer. Currently, it is possible to connect to servers in 13 countries: Panama, Sweden, Australia, Hong Kong, Romania, United States, Switzerland, New Zealand, Turkey, Germany, Malaysia, Canada and United Kingdom. The list of options may seem limited if you compare it to other providers. However, the servers are strategically distributed to ensure that you enjoy good speeds and that you can access great content securely. Plus, they are regularly updating their network and it is likely that new options are added soon. P2P is allowed and you can connect to servers that are specially designed to offer the best performance for torrenting. FastestVPN lives up to its name by offering fantastic speeds and unlimited bandwidth so you can stream, download and play online games without issues. 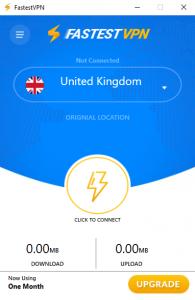 High quality and a good set of core features make FastestVPN an appealing VPN solution, but another aspect that will attract customers is the affordable price of the plans. If you are looking for a simple, secure and conveniently priced VPN service, FastestVPN could be just what you need. You can subscribe for a full year for $44.95 USD, which means that the price per month is just $3.74. This is a significant discount from the monthly plan, which costs $10. If you want to get the best value for money, make sure that you check their current offer, which allows you to get three years of FastestVPN for $49.95. This reduces the monthly cost to just $1.38. There is no free-trial available, but you are covered by a 7-day money-back guarantee that gives you time to try the service and find out if it is right for you. The payment methods accepted are Bitcoin (the best option for anonymity), credit cards and PayPal. The Support Center on the website allows you to get easy access to all the help and information resources available. You can check the Knowledge Base, the FAQ and the Set up guides. If you need to reach out to the Customer Support team, you can use the Live Chat or send an email. After testing the live chat, we confirmed that FastestVPN offers fast and efficient responses. They replied to our questions in a friendly manner and providing the information that we needed. FastestVPN offers the basic features needed to protect the privacy and security of your internet traffic, and to bypass restrictions effectively. Although it is fairly new to the market, the fast service and reliable performance provided, along with the top customer support available, show that FastestVPN is on the right path. Unfortunately, at the moment, there is no kill switch available, but FastestVPN is set to implement this option in the near future. The provider is also likely to add more servers to respond to the needs of its growing customer-base. FastestVPN is a promising solution that offers a high level of security and privacy, as well as great speeds to improve your internet experience.